You might have watched its infomercials thousands of times, or might have seen demos in malls or in expos, but you still can’t figure out the fuzz about how the Red Copper Pan will be able to improve your cooking skills and increase your efficiency in the kitchen. This review will help you understand why people are fond of using these pans and how will you be able to benefit using it. While other pans deliver quality food and perfectly done recipes, here are some of the ways the Red Copper Pan have an edge on its mainstream rivals. When I say lightweight, I don’t mean to say that its light in the sense that it feels inferior and cheap. It is light to hold but you can still feel the durability and strength in the pans. You can easily toss, whip, and do a lot of stuff without the fear of dropping it. You also do not need to exert much effort in moving it around so you save energy and cook more accurately. 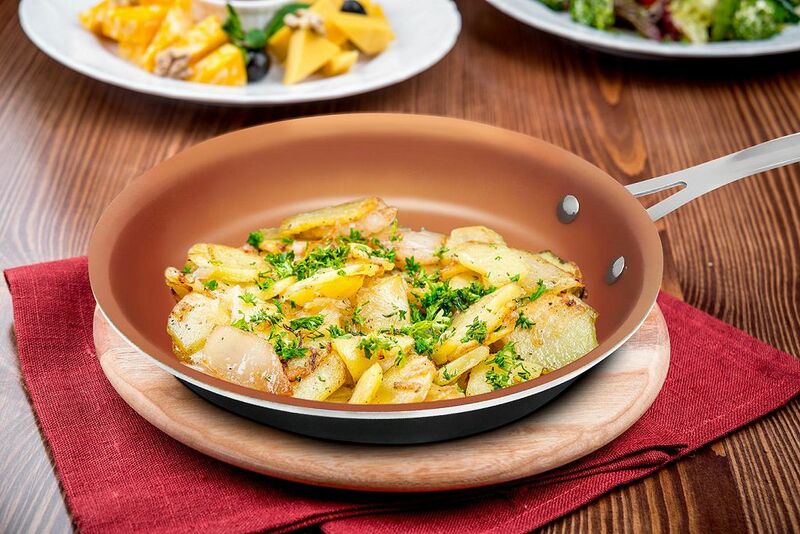 Almost every cookware claims to be non-stick nowadays, but the Red Carpet Pan has real non-stick properties that you literally don’t need oil or grease to cook in it. The food just slides out of the pan and into the plate with ease without having to poke or scrub it. You don’t have to worry about poking or scrubbing though, the surface is highly durable and scratch-proof. Not that you have the need to scrub or scratch your Red Copper Pan though. The durability makes it really easy to clean. Just pop it in the dishwasher and it will be good to go. Carcinogens and harmful chemicals are around us all the time. It is good to know that we can avoid it in our food through the means that we cook it. The Red Copper Pan is PFOA and PTFE-free, which means you are not exposing your family to toxic chemicals. The ceramic cooking surface means that there is no reaction whatsoever that will make the pan corrode however acidic the food is. The best thing about copper is that it is a very good heat conductor. It heats easily, spreads the heat evenly throughout the pan, and retains the heat long after the source has been shut off. Whether you prefer glass top, electric, or gas st​​oves, it ensures that food is cooked faster, more efficiently, and evenly. When a product is effective and delivers what it promises, consumers are drawn to it. But there are other entities that are also drawn to successful innovations such as the Red Copper Pan. Imitations, knock-offs, and cheap poorly-made copies also hit the shelves, victimizing poor unsuspecting customers and blemishing the name of the original product as well. Since it is difficult to spot fake items especially if you purchase online, here are some tips to minimize the chances of you getting a cheap knock-off. Always acquire items from reliable sources. This is basic and pretty much applicable to all of our purchases. If you want to get legitimate items, make sure to get them from the manufacturer’s website directly. If you have to go through a reseller, make sure that it is a credible and trusted. Don’t fall for unbelievably low price or promotions that definitely seems like the company had some price tag error. You have seen articles of people buying stuff online and getting ripped off. Good things tend to be expensive. The price could be cheaper, but not by almost a hundred percent. Make sure to read consumer reviews. Although there are some that are paid or inaccurate, consumer reviews are still the most reliable source of information about a product. Skim through the reviews to know what the people feel about the product, whether it be fake or real..
Let us check the top Red Copper Pan cookware available today. This five-set piece includes the 10” square pan, a glass lid, a steamer plate, a fry basket, and the cookbook. With its tall 6” sides, you can do a lot of cooking such as deep frying, roasting, and even bake with its oven-safe built for up to 500°F. It is truly a one-man show in your kitchen. If you are just starting out or cannot afford to all the necessary cookware, this is the perfect set for you. It has a ceramic non-stick surface for easy food release and easy cleaning. The possibilities are endless with its 10” width and 4” height. You can cook virtually anything. You can be sure that no toxic chemicals are being mixed with your food since it is PFOA and PTFE-free. It comes with a fry basket, steamer plate, and a cookbook for a better all-around cooking experience. It comes with a lifetime replacement guarantee, making it a risk-free investment. The cookware is not compatible with induction heat stovetops. The worst things in frying are the guilt you feel knowing that there is oil in the food you are cooking, and cleaning up the food that got stuck up and burnt on the surface. This cookware provides a solution to both problems. The non-stick surface allows you to cook without using oil which means you will be eating healthier and with less cholesterol. This non-stick surface is also what makes this pan easy to clean. There are no more residues to submerge in hot water for a long period of time and scrape. It is just pure cooking fun and healthy meals. It has a healthy PFOA and PTFE-free nonstick surface that allows easy release of food without the risk of ingesting toxic chemicals. The 10” size makes it a versatile piece that can do more than just fry. You can directly use it in the oven since it is oven safe for up to 500°F. Cleaning is easy since you can just easily wipe off the residue and it is also dishwasher safe. Its copper infused body is a strong heat inductor and distributes heat evenly over the food. It retains heat long after the pan has been removed from the heat source. The lid has to be bought separately. It is not compatible with conduction heat stovetops. What makes this cookware great is its 12” size that can accommodate large amounts of food. Cooking will be a breeze with its copper infusion that allows faster heat conduction and even heat distribution. Handling the pan or putting it in and out of the oven is easy due to its stay-cool handle. Equipped with a non-stick ceramic cooking surface, the pan is perfect for easy food release and easy cleaning. The family is safe from harmful chemicals since it is PFOA and PTFE-free. The nonstick surface makes it perfect for healthy, oil-free cooking. It has a 12” diameter that is best for large amounts of food. The stay-cool handle makes it easy to handle whether in tossing, whipping or during transports to the oven and back. You can be sure that the family is safe with its PFOA and PTFE-free ceramic cooking surface. Cooking is made more efficient with its fast heat induction and even heat distribution. It is easy to clean since it is scratch proof and dishwasher safe. The lid is not included in the package. It is not compatible with induction heat stovetops. The bottom surface is somehow uneven making it not suitable for flat top stoves. If you can’t get enough of Red Copper cookware you might as well get this 10-piece set. This set includes an 8” frying pan, a 10” fry pan with lid, a 1.5qt, a 2.5qt, and 6qt sauce pots with lids plus an aluminum steamer insert. It is the complete set for all of your cooking needs. It has the strong nonstick capacity that allows the perfect food release and promotes a healthy lifestyle with oil-free cooking. You can cook the food more efficiently with its fast heat induction and even heat distribution. With its range of sizes, you can be versatile enough to cook anything with this cookware. The complete set provides versatility in cooking. Its non-stick ceramic coating is PFOA and PTFE free, making it safe and healthy for you and your family. Cook easy and efficiently with the copper’s ability ton conduct heat fast, distribute heat evenly, and retain heat even away from the heat source. The scratchproof surface can withstand the impact of metal utensils. The lifetime replacement warranty makes it a risk-free investment. The handles are not stay-cool and using mitts is a must. Availing of the lifetime replacement warranty can be a challenge. With its compact frame and square body, it is easy to prepare and cook meals for one or two persons. You can make perfect omelets without using oil or even bake without greasing the pan with butter. It is dishwasher and oven safe, at the same time safe for you since it is PTFE and PFOA-free. If you can’t afford to buy a complete set right now or doesn’t have enough storage space to keep bigger pans, this pan is the best for you. The non-stick surface is PFOA and PTFE-free. Rest assured that no toxic chemicals are transferred to the food. It also promotes a healthy lifestyle with oil-free cooking. 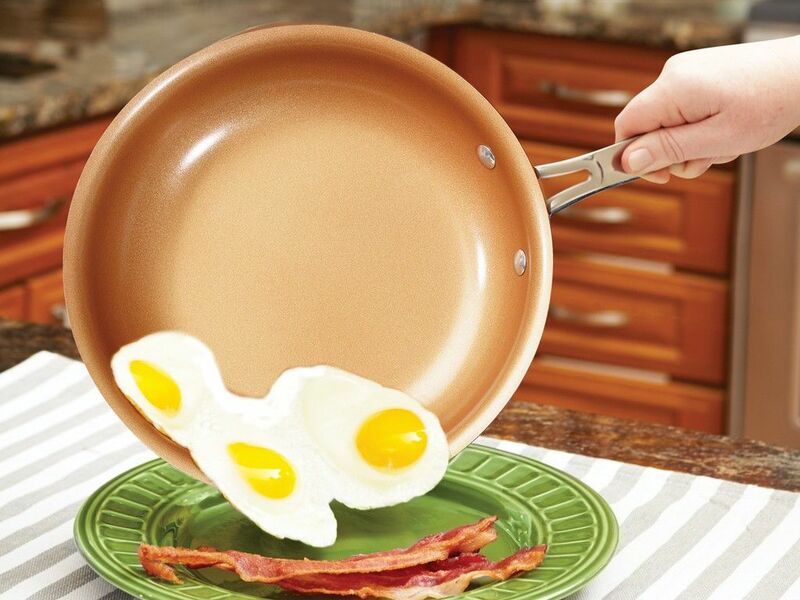 The nonstick coating also makes it easy to clean since no residue sticks to the pan and it is also dishwasher safe. It has the fast and efficient cooking properties of copper like the fast heat induction, even heat distribution, and long heat retention. The lifetime replacement warranty makes it a value-added purchase. There is no available lid for this pan. The sides are short to do anything else than frying. Personally, I’d go with the Bulbhead Red Copper Non-Stick Square Ceramic Cookware 5 Piece Set, but for the complete cooking experience, the best is the Red Copper Ceramic Non-Stick 10 Piece Cookware Set by BulbHead. Same company, same lifetime replacement warranty, same features, but only more versatile and a lot more pieces to choose from.